A gilded bronze water dropper in the form of a mythical animal. This creature has a singlehorned, dragon-like head and the body of a tortoise with three feet. Its bulging eyes, wavy mane, scaly body and three-clawed feet are finely cast and carved. An aperture is positioned in the middle of the back for allowing water to be poured into the hollow body, whilst the mouth has a small opening. The base is engraved with the four-character mark of Xuande (Xuande Nian Zhi). It has acquired a deep patina whilst some of the original gilding is visible. This bronze water dropper is the type of vessel for adding water to rubbed ink, using an ink-stone. The flow of water could be controlled by placing a finger or thumb over the aperture in the back, and the tiny hole in the mouth acted as the spout. Apart from its practical function, it is also a finely cast miniature sculpture for the scholar’s desk. Although the piece is engraved with the four-character mark of the emperor Xuande, who reigned from 1425 to 1435, the piece is unlikely to date from that period, but the compactness and the delicate craftsmanship certainly suggest a Ming dynasty date, albeit of a somewhat later period. A three-footed tortoise is considered to be auspicious in Chinese culture, which was recorded in Shan Hai Jing (Classic of Mountains and Seas), a classic Chinese text and a compilation of mythic geography. 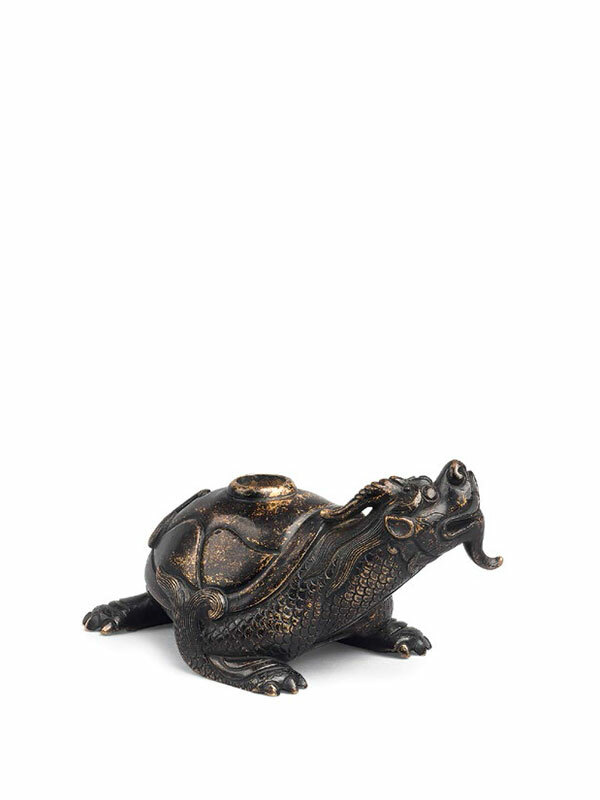 A Ming dynasty jade water vessel in the form of a tuolong, a mythical beast that combines the features of a dragon and a tortoise, was exhibited in the Fung Ping Shan Museum at the University of Hong Kong in 1986.1 A gold-and-silver inlaid bronze water dropper in the form of a tortoise with a snake on its back (xuanwu in Chinese), similar in size and dated to the late 16th – 17th century, is in the Robert H. Clague collection at the Phoenix Art Museum. 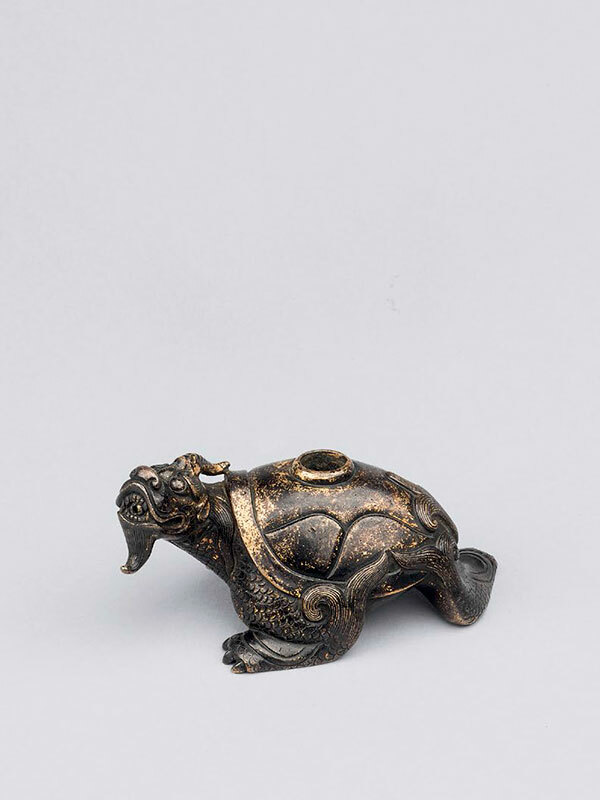 A comparable bronze water dropper in the form of a flying qinlin, similar in size and dated to the 15th – 16th century, is illustrated in Chinese and Japanese Bronzes, A.D. 1100-1900. A Yixing pottery water dropper of a three-legged tortoise, dated to the early 17th century, was included in the exhibition Yixing Pottery at the Hong Kong Museum of Art in 1981.